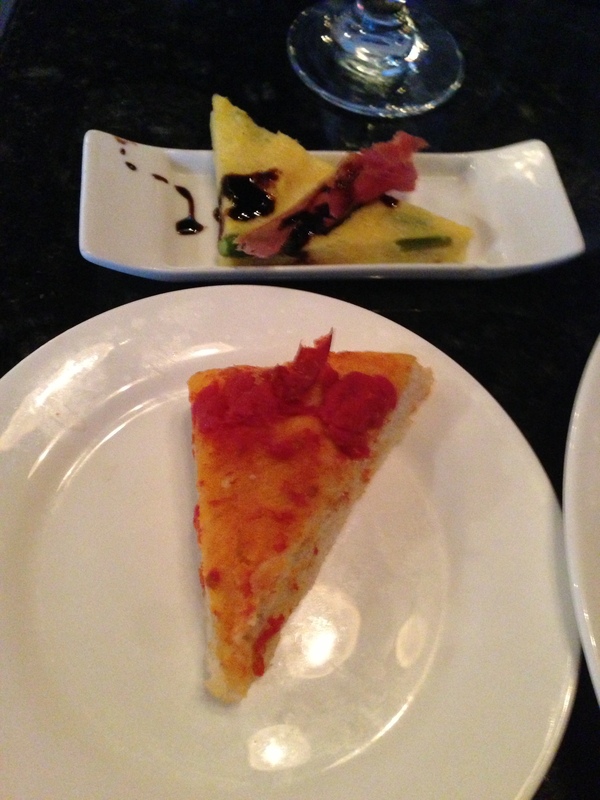 Editor’s Note: Panevino is now only open for special events. The Goggleworks has truly been a blessing to the City of Reading. Thanks to this community arts center, the neighborhood has truly blossomed into the city’s cultural district. Reading Area Community College opened the Miller Center for the Arts in 2007 and the IMAX theater opened a year later. What the area lacked was a signature restaurant, a place to go before or after the cinematic, musical and theatrical events taking place every night. That changed in 2011 with the opening of Panevino. The restaurant actually sits under the Washington Street parking garage, directly across the street from the IMAX theater. It’s nothing glamorous from the outside, but it’s beautiful on the inside with low lighting, fine china and glassware, and modern styling. Self-described as “rustic Italian cuisine,” the menu mixes traditional favorites like rigatoni and thin crust pizza with Panevino’s unique dishes, like the straw and hay – spinach and egg fettuccini served with lamb meatballs, eggplant, tomato, raisins and pine nuts. Every meal is served with a unique appetizer I have never had anywhere else. It is served in two parts to eat together or separate. The first is a slice of bread – more closely resembling a thick pizza crust – topped with fresh tomatoes. The second, a wedge of polenta and a thin slice of roast beef, drizzled with balsamic vinaigrette. It seemed like an odd pairing, but somehow it worked. All of the flavors blended nicely together. 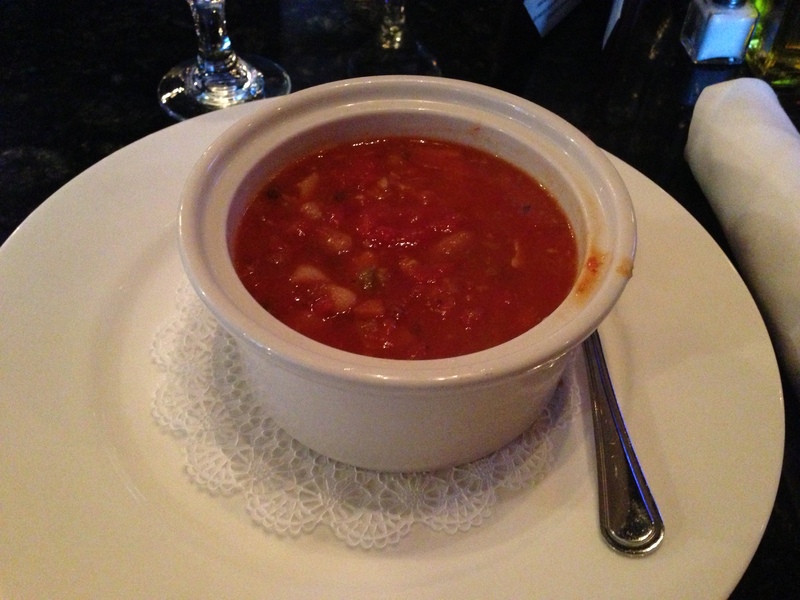 I started my meal with a bowl of pasta fagioli, a staple on any Italian menu, and a great indicator of the meal to come. The fagioli is served in a small crock, a paper doily resting underneath. It was very good, sweet and spicy, meaty with a hearty serving of beans. The dish was completed with thin cut slices of farfalle pasta, one of the many pastas Panevino makes from scratch. 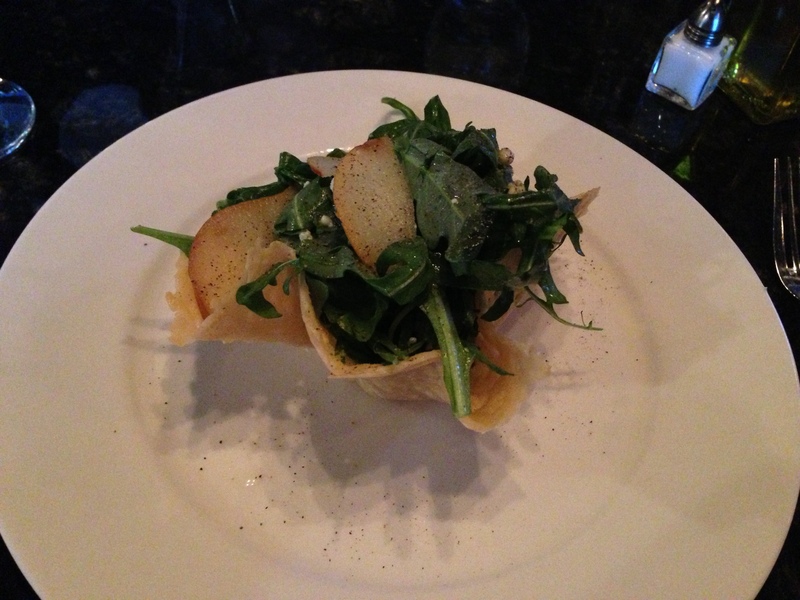 Salads have never been my favorite, but I had to try the Arugula, a mixture of arugula leaves, pears, gorgonzola and leafy greens drizzled with white balsamic vinaigrette, and served in a parmesan bowl. Despite my general disdain for salad, I found myself enjoying this, especially the edible bowl. The parmesan flavor was strong and concentrated, much more so than the flavor of grated parmesan. The closest thing to compare it to is the pre-packaged breadsticks some restaurants serve, but with a better, fresher, stronger (sometimes a little too strong) flavor. The main course was, by far, the best part of the meal. 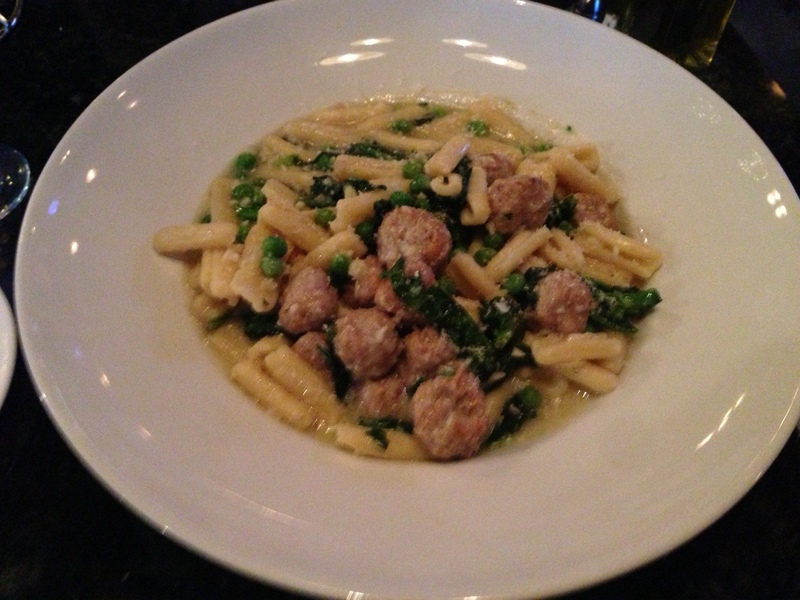 Thick, fresh cavatelli pasta with pork meatballs, peas and broccoli raub in a light cream sauce. Everything worked well together. The pasta was cooked perfectly, starchy enough to absorb the sauce. It was a rich sauce that continued to thicken as I ate. The meatballs were tender and moist – with all the spices, they didn’t taste much different than traditional beef meatballs; the peas didn’t add much flavor, but the broccoli raub was delicious, with a hint of smokiness that I wasn’t expecting. Unfortunately, there was no way to finish the meal so half of it had to come home with me. 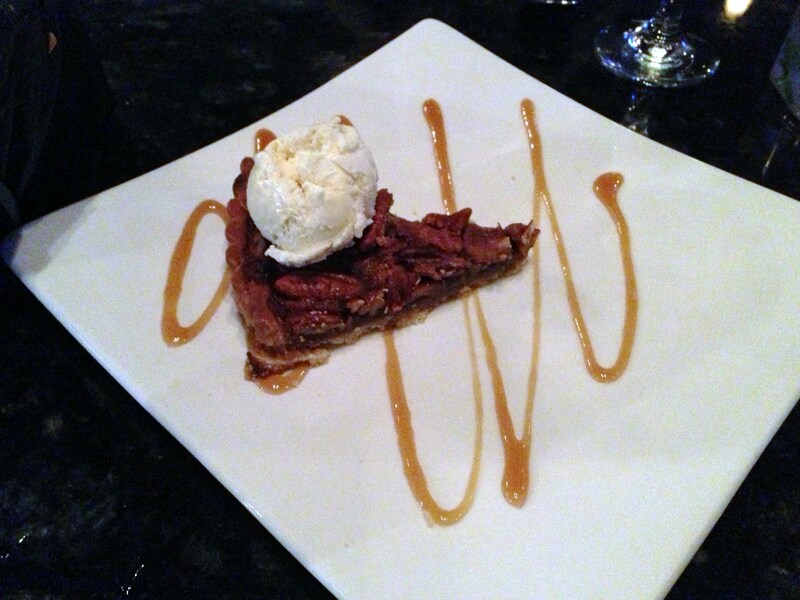 That didn’t stop me from ordering dessert, a warm piece of pecan pie with caramel drizzle and vanilla ice cream – good, but nothing special as far as pies go. The crust was a little overcooked, but the ice cream hid it well. The wait staff worked as a team – at times this was helpful, and at times it wasn’t. At the end of the night, it took long time for us to get our bill, and two separate team members wanted to take our dessert order. For all the food we got – two entrees, a cup of soup and dessert – the bill was surprisingly reasonable, about $25 per person. With the delicious food in a fine dining atmosphere, it was $50 well spent. May 6, 2013 in Italian, Reviews.